Circularly polarized light delivered at a particular angle to C-shaped gold nanoparticles produced a plasmonic response unlike any discovered before, according to Rice University researchers. When the incident-polarized light was switched from left-handed (blue) to right-handed (green) and back, the light from the plasmons switched almost completely on and off. Rice University researchers studying the effect of light on pinwheels (left) and single C-shaped (right) gold nanoparticles have found an unknown effect on single particles. Stimulating the particles just right produced a near-perfect modulation of the light they scatter via their plasmonic response. The discovery may become useful in the development of chips for next-generation optical components for computers and antennas. 04-Dec-2018: Rice University researchers have discovered a fundamentally different form of light-matter interaction in their experiments with gold nanoparticles. They weren't looking for it, but students in the lab of Rice chemist Stephan Link found that exciting the microscopic particles just right produced a near-perfect modulation of the light they scatter. The discovery may become useful in the development of next-generation, ultrasmall optical components for computers and antennas. The work springs from the complicated interactions between light and plasmonic metal particles that absorb and scatter light extremely efficiently. Plasmons are quasiparticles, collective excitations that move in waves on the surface of some metals when excited by light. The Rice researchers were studying pinwheel-like plasmonic structures of C-shaped gold nanoparticles to see how they responded to circularly polarized light and its rotating electric field, especially when the handedness, or the direction of rotation of the polarization, was reversed. They then decided to study individual particles. "We stripped it back into the simplest possible system where we only had a single arm of the pinwheel, with a single incident light direction," said Lauren McCarthy, a graduate student in the Link lab. "We weren't expecting to see anything. It was a complete surprise when I put this sample on the microscope and rotated my polarization from left- to right-handed. I was like, 'Are these turning on and off?' That's not supposed to happen." She and co-lead author Kyle Smith, a recent Rice alumnus, had to go deep to figure out why they saw this "giant modulation." At the start, they knew shining polarized light at a particular angle onto the surface of their sample of gold nanoparticles attached to a glass substrate would create an evanescent field, an oscillating electromagnetic wave that rides the surface of the glass and traps the light like parallel mirrors, an effect known as a total internal reflection. 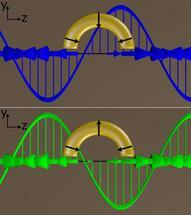 They also knew that circularly polarized light is composed of transverse waves. Transverse waves are perpendicular to the direction the light is moving and can be used to control the particle's visible plasmonic output. But when the light is confined, longitudinal waves also occur. Where transverse waves move up and down and side to side, longitudinal waves look something like blobs being pumped through a pipe (as illustrated by shaking a Slinky). They discovered the plasmonic response of the C-shaped gold nanoparticles depends on the out-of-phase interactions between both transverse and longitudinal waves in the evanescent field. For the pinwheel, the researchers found they could change the intensity of the light output by as much as 50 percent by simply changing the handedness of the circularly polarized light input, thus changing the relative phase between the transverse and longitudinal waves. When they broke the experiment down to individual, C-shaped gold nanoparticles, they found the shape was important to the effect. Changing the handedness of the polarized input caused the particles to almost completely turn on and off. Simulations of the effect by Rice physicist Peter Nordlander and his team confirmed the explanation for what the researchers observed. "We knew we had an evanescent field and we knew it could be doing something different, but we didn't know exactly what," McCarthy said. "That didn't become clear to us until we got the simulations done, telling us what the light was actually exciting in the particles, and seeing that it actually matches up with what the evanescent field looks like. "It led to our realization that this can't be explained by how light normally operates," she said. "We had to adjust our understanding of how light can interact with these sorts of structures." The shape of the nanoparticle triggers the orientation of three dipoles (concentrations of positive and negative charge) on the particles, McCarthy said. "The fact that the half-ring has a 100-nanometer radius of curvature means the entire structure takes up half a wavelength of light," she said. "We think that's important for exciting the dipoles in this particular orientation." The simulations showed that reversing the incident-polarized light handedness and throwing the waves out of phase reversed the direction of the center dipole, dramatically reducing the ability of the half-ring to scatter light under one-incident handedness. The polarization of the evanescent field then explains the almost complete turning on and off effect of the C-shaped structures. "Interestingly, we have in a way come full circle with this work," Link said. "Flat metal surfaces also support surface plasmons like nanoparticles, but they can only be excited with evanescent waves and do not scatter into the far field. Here we found that the excitation of specifically shaped nanoparticles using evanescent waves produces plasmons with scattering properties that are different from those excited with free-space light."